On inauguration day, after a quick trip to Ikea so that R could return some stuff, we stopped by PF Chang’s for a quick dinner. My mom loves PF Chang’s, so I almost picked it for my birthday meal with her, but since I went on inauguration day, we ended up somewhere else. But more on that later. If you’ve been, you know about their sauces. 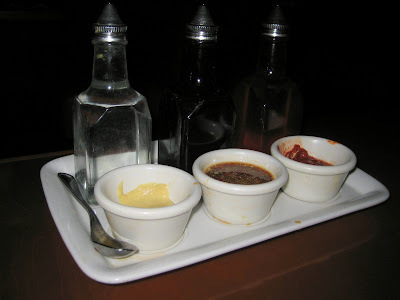 The mustard, vinegar, and hot sauces that they customize and mix in front of you. Whether you’re going to end up using it or not, it doesn’t matter. They put on a little show where they mix the ingredients in front of you. And for the most part you’ll not even use them. It seems a shame and a waste really. They’re slightly weird about their soups here. You can get individual soups, except for wonton soup. You can only get wonton soup in ginormous size, that has to be shared by at least 2 people. Why oh why, PF Chang’s, can’t you just let us have one portion of wonton soup? Well since it was absolutely freezing out, I was in the mood for soup, so we shared. It was more than plenty for us both. 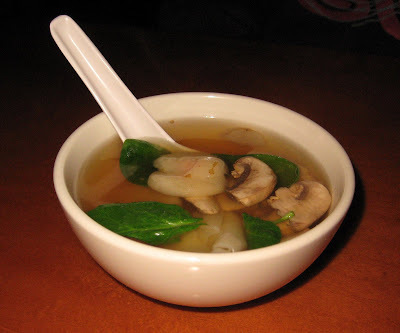 I liked the broth, and the fact that there were shrimps and fresh mushrooms and spinach in there, but the wontons weren’t as impressive. The wonton wrappers they use are very thin and the wontons themselves are a little wimpy. We got the crispy honey shrimp and the orange peel chicken. The shrimp was delicious. Oh my gosh. I totally loved it. Lightly battered, perfectly fried, with a good sauce. Yum! The chicken was just ok. It was a bit on the spicy side, and it didn’t really taste very chinese. I mean, that sounds weird, but to me, it had more of a korean flavor than a chinese flavor. As if they’d used korean red pepper paste kochujang, instead of something chinese. It’s not that it tasted bad, it’s just that it wasn’t what I expected. 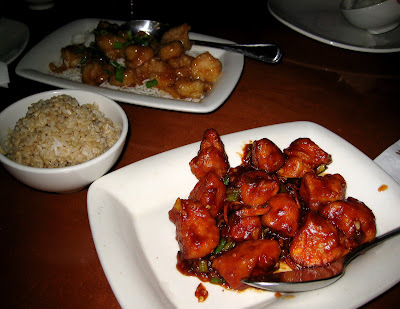 I wanted the food to taste chinese, since PF Chang’s is supposed to be a chinese bistro. Oh and I got brown rice. You know that it’s all about the brown rice here, so I won’t even really need to reiterate. Service wasn’t particularly good. Our waiter was clearly not born to be a waiter. He seemed to be maybe a high school or college kid, a frat boy type, and it was clear he didn’t take it very seriously. In fact, he flubbed something up, and he totally called himself on it saying how he’d messed that up. That was a big endearing, but unfortunately, it didn’t make up for him being a bad waiter. I hope he has a backup plan!